All Good Beer: Brasserie Beck in Washington, D.C.
Brasserie Beck in Washington, D.C.
Washington D.C. seems to have a pretty good Belgian beer culture going on. I stumbled across Brasserie Beck while researching beer bars to visit during our trip and after seeing their awesome looking food menu and huge Belgian beer list, I knew we had to have dinner there. Since my birthday occurred during our trip, this was also going to be my birthday celebration dinner. It was a Sunday evening, so the restaurant was relatively quiet, but we still had to wait briefly at the bar for a table on the patio outside. 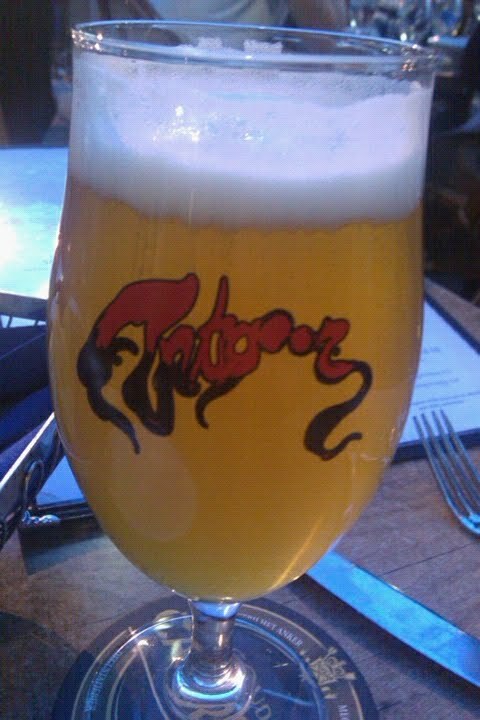 This gave me a few minutes to review the binder of Belgian beers that I was handed, but we were seated before I had chance to order anything. Our waitress was very friendly and attentive and had no hesitation describing or recommending food items or beer. 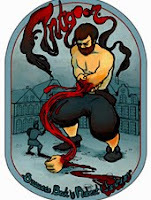 I started with an Antigoon, the house beer brewed specifically for Brasserie Beck by Belgium's Brouwerij de Musketiers. The beer is named after a mythical giant who terrorized Antwerp until his hands were cut off by a Roman solider and that gruesome image is depicted on the tap handle label. It's a Belgian Double Blonde with aromas of lemons, apples and Belgian yeast. The flavour expands on the aroma with the addition of peppery spices and a little sweetness. Finish is smooth and dry. With an ABV around 6.5%, it would make a good slow and lingering session beer. It was apparently just released in 750ml bottles this spring and is available at various beers stores around D.C.
My wife enjoys the occasional bottle of Lindemans Peche Lambic at home, so we ordered her the St. Louis Premium Peche. Despite what the name may imply, it's from Brouwerij Van Honsebrouck in Belgian and not brewed in Missouri. It was a little too sweet for me, but my wife liked it. It didn't have any of the sour and tartness that are typical in Lambics to help balance the sweetness. Thor Cheston, the Beer Director and General Manager, stopped by our table when he noticed my empty glass of Antigoon to check on how we were doing. We talked about some of the beers on the menu and I decided to try the Caper Fumatis from Picobrouwerij Alvinne. Its a Smoked Belgian Bock with aromas of caramel, roasted malts and very mild smoke. The flavour is similar with the addition of sweet dark berries and a slight bitter finish. The smoke is strong enough to make its presence known in the aroma and flavour, but does not overpower. 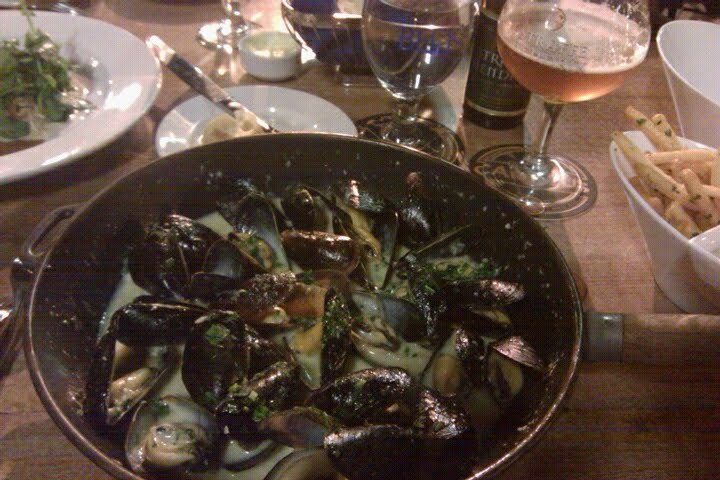 For dinner, I ordered the steamed mussels in the traditional white wine broth. The mussels naturally came with frites but was accompanied by a trio of mayo dips (garlic, curry and tomato) instead of just the usual plain mayo. The frites were light and crispy and the curry mayo was our favourite. The mussels were plump and meaty and I eagerly soaked up the rich flavourful broth with crusty french bread (I read online that the mussels are served in a flat pan and not the more traditional pot so that its easier to soak up the broth). And to accompany my wonderful meal, Thor was on hand to suggest a bottle of Straffe Hendrik, a Belgian Tripel. The sweet flavours of citrus, pear and banana are balanced by a spicy dry finish. The ABV of 9% was completely hidden which is probably why I had two of them. 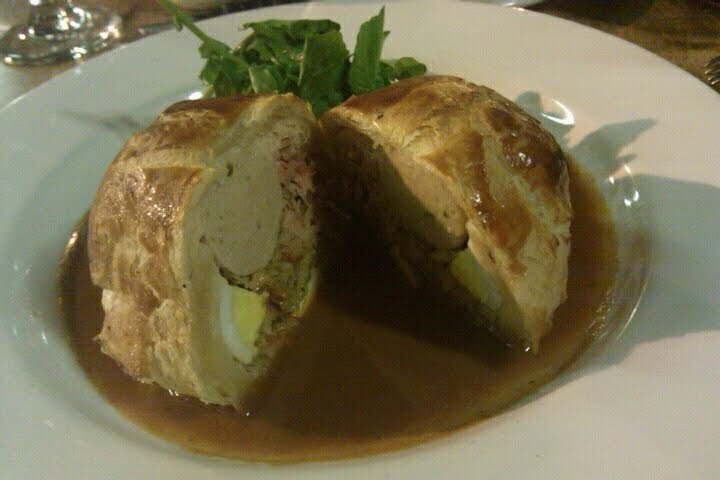 My wife ordered the Choucroute en Croute which was a house-made white sausage, a boiled egg, pickled cabbage and sliced pork all wrapped up in a lightly browned puff pastry shell. Fantastic! We actually took half of it back to the hotel and put it in the mini-bar fridge and ate it as a snack the next night. At some point during the evening, my wife had surreptitiously mentioned to Thor that it was my birthday. We ordered the Pear Tarte Tatin with Crème Fraîche Ice Cream for dessert and it arrived at our table with a burning candle and Happy Birthday scripted in chocolate. 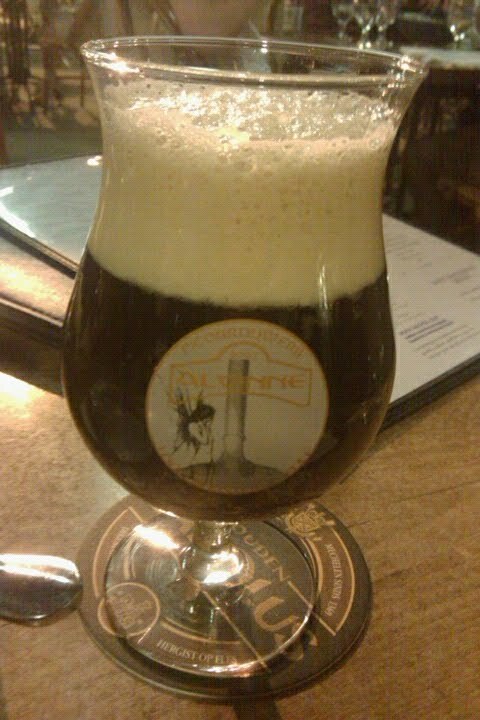 Naturally, I needed yet another beer to accompany dessert (actually, I really didn't) and went with La Chose from Le Trou du Diable, the Quebec brewery that I had tried a few nights before at the Churchkey. Described as a cross between a Scotch Ale and an India Pale Ale, it had sweet flavours of caramel, pineapple and other fruits with a bitter hoppy finish. It was an interesting combination and the second beer from this brewery that I've been impressed with. It was a wonderful evening at Brasserie Beck and I hope we can return again soon. I'd particularly like to thank the General Manager, Thor Cheston, for taking the time to discuss the beers and make recommendations and generally ensure that we had a great birthday celebration. Was just there, Presidents Day weekend 2011. What a great place. Food, decor, great, and a great wine and beer list. Highly recommended if your in dc.